December 30, 2010 - Another new Boeing Next-Generation 737-800 with the new Boeing Sky Interior took to the skies over Seattle on Wednesday, as Continental Airlines. A wholly owned subsidiary of United Continental Holdings, Inc., became the first U.S.-based carrier to fly with the new interior. Continental's jet features the new United Airlines livery. Wednesday's flight marks completion of 13 deliveries to the first five launch customers for the innovative 737 Boeing Sky Interior. 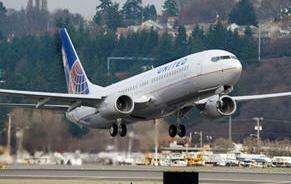 The airplane also marks a new record for 737 yearly deliveries of 376. The previous record was 372 deliveries in 2009. "We are proud to be the first carrier in North America to introduce the brand-new Boeing Sky Interior to our customers," said Ron Baur, United fleet vice president. "The new lighting and sculpted side panels give the 737 a modern and more spacious look, while providing increased overhead storage space." The 737 Boeing Sky Interior is part of Boeing's strategy to continuously improve the 737 for both airlines and passengers by making it more efficient and economical to operate and maintain and more comfortable for passengers. Today's Next-Generation 737 operators fly 737s that are 5 percent more fuel-efficient than the first Next-Generation 737s delivered in 1998, and another 2 percent improvement is on the way. In mid-November, another 737-800, also in the new United Airlines livery, successfully completed an early flight test to begin certification of the aerodynamic and engine changes that will result in the 2 percent improvement. Testing and certification will continue through April 2011. Boeing is phasing into production the performance improvement package, beginning in mid-2011 through early 2012. One percent of the savings comes from reducing resistance as air flows around the airplane. The upper and lower anti-collision lights change from round to a more aerodynamic, elongated teardrop shape. Wheel-well fairings are re-contoured to smooth the air flow near the main landing gear. A redesign of the environmental control system, exhaust vent and streamlined wing slat and spoiler trailing edges round out the aerodynamic changes. CFM is introducing the new CFM56-7BE engine enhancement program to coincide with Boeing's airframe changes. Low- and high-pressure turbine modifications will result in a 1 percent reduction in fuel consumption. In addition, Boeing is optimizing the engine's primary nozzle and plug. Together, the changes result in cooler-running engines that may provide up to 4 percent lower maintenance costs. The CFM56-7BE engine is currently undergoing a 10,000 cycle endurance test at Snecma facilities in Villaroche, France. The test should be complete in early 2011. These tests simulate conditions far more extreme than would be experienced in commercial service to validate the reliability and durability of the hardware.